Even with today’s communication tools many dentist and lab technicians never truly communicate. The result is not only frustration but can result in an inferior product. In this two part program we will follow a full upper arch case from beginning to end. Dr. Tom Trinkner demonstrates a conservative preparation while ceramist Matt Roberts demonstrates the time it takes to build a single tooth and why records like a stick bite and digital pictures are so important. Disclaimer: No commercial support was received for this program. Discuss the necessary records to send to your lab for the best results. Describe when to use implants verses a bridge. List the necessary steps to take in using a reduction guide. Discuss the advantages and disadvantages of packing cord. Understand the preparation that the ceramist does prior to building restorations. Part 1 - Why conservative dentistry should always be the first option. 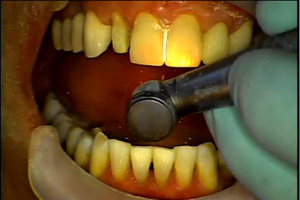 In this dental CE course, Dr. Tom Trinkner reviews a conservative approach to restorations. He will also discuss what information is necessary to communicate to the lab. Part 2 - Why the preparation matrix defines the case. In this section of the continuing education course, Dr. Tom Trinkner reviews the preparation matrix. Part 3 - Luxatemp and the completion of the temporaries. In this section of the dental continuing education, Dr. Trinkner demonstrates the process for creating the temporaries. Part 4 - The build up of the upper arch utilizing Lava material. Ceramist Matt Roberts evaluates the information that was sent by Dr. Tom Trinkner and then demonstrates the build up of the upper arch utilizing Lava material in the next section of this dental program. Part 5 - Porcelain selection and why it is so important. In this section of the dental continuing education course, Matt Roberts discusses porcelain selection and why it is so important. In the second part of this two-part series, we follow a full upper arch restoration.